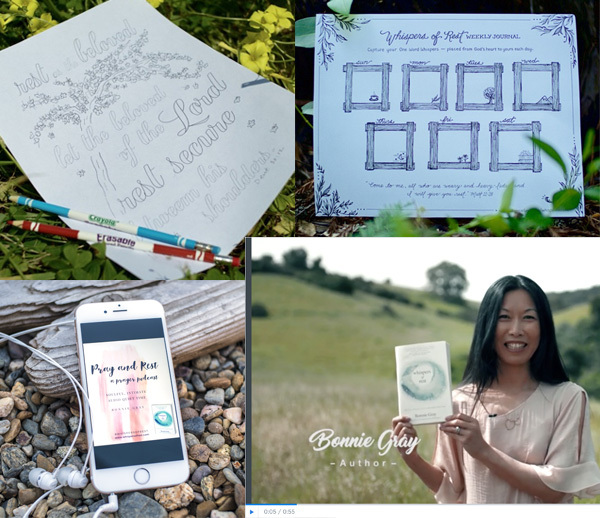 Long ago, on a day when I was feeling particularly frazzled and lonely, I accidentally landed on the blog of a woman named Bonnie Gray. I don’t remember how I got there, but I remember how I felt when I read her words. My nerves unraveled. I felt the peace of God. I felt like I’d found a friend. And then, she became my actual friend — the kind of trusted friend who will always point you to the goodness of Jesus. It’s an absolute privilege to host Bonnie on the blog today. We are celebrating the recent release of her devotional, Whispers of Rest. The book is a 40-day detox for your soul. Absolutely stunning … Welcome, Bonnie. I didn’t know that I was hiding. I’ve always been good at praying. My daddy left when I was seven. I’ve always looked to God as my Father, my provider. I didn’t realize God wanted to be more than just my provider. God longed to be my soul’s confidante. Deep where I felt lonely — where I struggled to receive and make space for me — God wanted me to rest as His beloved. Because at the end of the day, even though I had accomplished a lot, I didn’t feel like I had fully lived. Because what I really wanted, I didn’t make space for: peace and joy. I did not nurture my soul with God. I found it easier to take care of others and get things done for God, rather than be vulnerable with my needs. But God showed me prayer is an intimate soul conversation to be loved and known, rather than a spiritual transaction to be made better. Praying touches the part of me that is in process, uncertain, full of questions and doubts. That is why praying is hard to do. And when I didn’t know how to pray, it made me feel ashamed. Jesus said the opposite! We’re invited to come to him weary— whether confused, numb, anxious, angry, or stressed. Jesus tells us to simply come. Imperfectly his. As we are. Although partially true, this can de-humanize our connection with God. The psalmist reminds us there are no easy answers. Sometimes, it takes more faith to tell God we don’t know how to pray — rather than praying for faith to pray like we used to. 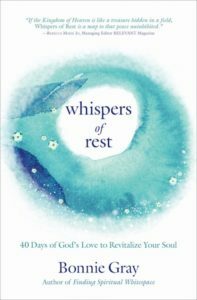 This is how I began to discover God’s “whispers of rest“ – powerful Scriptures affirming God’s love for me and learning about soul care: practical ways to feel God’s peace and presence! I started learning how to love myself the way God loves me. I began researching ways to spark joy and take simple actions to prioritize my well-being, which I wrote about in Whispers of Rest, a book that has just released. Do you long to refresh your soul, spark joy and feel God’s love and peace in new ways too? Well, to my delight, I uncovered 40 easy, soulful ways to pray– even when we feel stressed. These simple, daily rhythms renewed my peace and joy with God – and I know they will renew yours as well! Here are five in Whispers of Rest. 1. When you’re overwhelmed, whisper His name. Remember receiving a first love note? It didn’t have to be long. Yet your heart felt known seeing your handwritten name. It kept you company in the daily grind. Whisper His name and listen for His echoes return in the quiet. God names the stars and He whispers your name. Your silence will not drive Jesus away. Nothing can separate you from His love. Not even your unrest. He’ll never get tired of you. Sometimes, the greatest prayer we can experience is God’s complete understanding and compassion. His presence. We are a generation who doesn’t know how to express our souls to God, even though we drive ourselves exhausted, doing for Jesus. Extend yourself the kindness and comfort you generously give others. Ironically, the times we most need God’s comfort are the times we deprive ourselves of soul-nurturing time. Instead of layering on guilt, let God love you through your choices to prioritize taking care of you. 4. When you feel numb and don’t want to pray, invite Jesus into your world. Instead of struggling to reach Jesus, invite Jesus to enter your world. Research in a NY Times article shows the power of writing your personal story can lead to behavioral changes and improve happiness. Even 15 minutes of expressive writing makes a difference. When we journal our stories with God, we give Him space to re-write our stories with us. Don’t you get ah-ha moments as you write? “Word” is the Greek word logos, which translates as living voice. God is not limited to the written word. God uses everything living to speak into our lives. This includes journaling. 5. When you’re too exhausted to pray, stop and rest. Elijah had done everything he knew to do—even defeating the prophets of Baal. Yet, his problems did not go away and actually got worse! Stress broke Elijah’s spirit. In despair, Elijah woke up to find fresh bread baking on hot stones and water—left just for him. Not only that. God sent an angel—to touch him—twice. God knew Elijah needed physical rejuvenation first in order to hear His gentle voice, whispering in a gentle breeze. So, when you find it’s hard to pray, don’t be afraid. You’re standing at the very cusp of who God longs to connect with. The real you. Take the time to rest. You’re worth it! Just rest. Pull up a chair: What helps you experience God’s peace and presence when you feel to stressed too pray? Bonnie is giving away a copy of her latest book! To enter, simply tell us, by commenting, that you’d like a copy. As always, extra shares on social media means more entries in the drawing. We work on the honor system, so just let us know where you shared. I will draw a winner Friday. 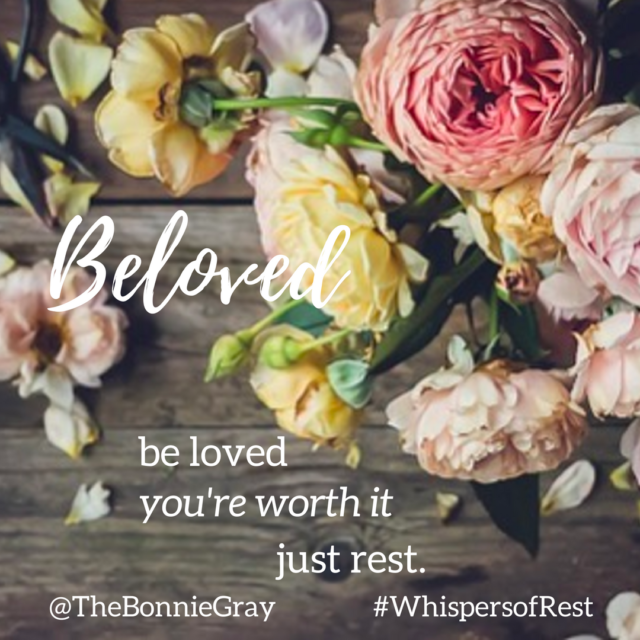 For more encouragement, order a copy of Bonnie Gray’s new 40-day devotional detox Whispers of Rest: 40 Days of God’s Love to Revlitalize Your Soul. She invites you to refresh your soul with God’s love at TheBonnieGray.com. Download Free Resources: 6 Video Book Study Series + 6 Prayer Podcasts + 6 Coloring Pages as free companions for your 40-day journey. Sign up at whispersofrest.com. 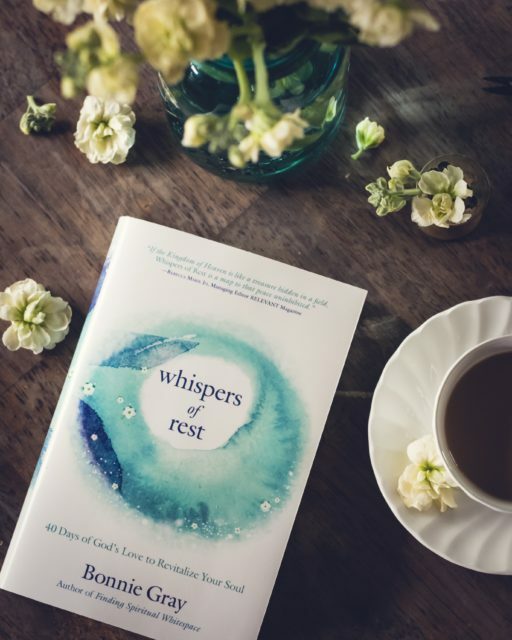 BONNIE GRAY is author of Whispers of Rest and Finding Spiritual Whitespace. 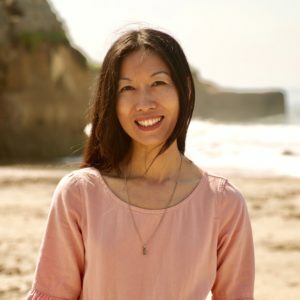 An inspirational speaker and retreat leader, she has touched thousands of lives through storytelling, visual arts, nature, prayer and meditation. Bonnie’s writing is featured on Relevant Magazine, DaySpring’s (in)courage, and Christianity Today. She lives in California with her husband Eric and their two sons Josh and Caleb. Our featured writer this week is Micah Maddox. If you’ve ever thought “I’d love to write a book one day” then Micah’s post titled ‘How to Get Published’ is for you. It isn’t a step-by-step plan, but a blog post full of encouragement and the reminder that God’s plan (and timing) is best. Find Micah here. I think I missed where to enter the giveaway – but I would really like to win a copy of Bonnie’s new book! You did it just right, Stacey. And if you shared on any of your social media, be sure to let us know here in the comments, as each entry = your name in the drawing. I would love to win a copy of this book – it sounds perfectly fitted for my soul right now! I have this book in my to-read queue. As soon as we get moved and I unpack, this one gets read! I shared on Facebook. I would love to win this book! Thank you! I’ll be sharing this on my timeline as well as Twitter and a private group I manage for Cultivating a Life Well-Lived. This is a powerful and beautiful message Bonnie. Thank you for being real and vulnerable while pointing to hope. Would love to read more of your words. Yes, #kindreds. Bonnie’s book was read and paid forward. Lovely lady. Lovely words. Something I need to do during this time. A copy of her book would be greatly appreciated. Really needed this reminder today about praying! Feeling so overwhelmed with much to do. Nice reminder to be still and let Jesus be Jesus for me. Would love the book! I would love a copy of Whispers of Rest!!! This is right where I am at in this season of my life. Would love a copy ! Would love a copy of this book! I will share on FB & Instagram! What a lovely article to give us tools to help us into His peaceful presence.. even when praying is difficult.Id love to win a copy of the extended version of ideas. Ill share on facebook. Lookingforward to checking out Bonnie Gray’s blog in the days to come. I would love a copy of Whispers of Rest! I will share too! Thanks Amy Odland for sharing! Sure would love to win this book – maybe it would help with my overstress and overwhelm! This is such a good article. Thank you, Bonnie, for sharing your book and resources with us here today. On this particular day, coming here helps me take a deep breath and know that it will be OK. Thank you as well, Jennifer, for sharing your space! I’m sharing this article on 3 socials. Bonnie, that is so sweet. Thank you! I would love to read this book. I’ve been going through a season, after praying so diligently for a family member. God did not change his direction and I find it’s hard to pray now. My heart is just so broken. I believe there is a reason why God worked the way He did, but it’s been difficult to watch a life walking in disobedience. I want to pray but I find I have no words. Thank you for sharing about Bonnie’s book. @disqus_ZsNVxJiFIA:disqus thanks for sharing so vulnerably here. can I pray for you? dear Jesus, thank you for Jocelyn. Reassure her of your complete understand and place your loving arms of love around her, so close that she can just sink into your embrace. Whisper the words of love that will bring her your peace and presence. Thank you for praying for my sister-in-Christ Jocelyn, even as she has no words, she doesn’t need them. Becasue you are right there with her. bring her comfort, in the way only you can do. You love her. You know her. In Jesus’ name, Amen. This book sounds like the just the antidote I need when I’ve allowed myself to be overcome by the world. Thank you for sharing the 5 ideas you highlighted in this piece; I liked them so much I shared them right away with my own readers over on my blog’s FB page. May Bonnie’s book be a wonderful success and a blessing to many! I would love to win the copy of Bonnie’s book. Thank you for sharing this story! Thank you for the opportunity to win a copy of this book! I would love it! And Bonnie is so right….we are worth it, but too often we don’t believe it. right now. I would love to read the book! I shared on google+ as well! Jennifer, you are such an example here in your hospitality to other authors and your willingness to share their work. Thanks for this glimpse of Bonnie’s praying heart. I’d love a copy of Whispers of Rest! As the kids start back at school, I need to develop new habits of my own. This sounds like something to soothe my soul. The Whispers of Rest seems like a great book to read. I would love to win a copy. I’d never thought of “rest” in that way before. Thank you! I would love to win a copy! I’m always excited about inspiring books. I would love to win a copy of this book! I need it, and I have a friend who would benefit from me passing it on to her, too! And Bonnie’s article just was published in Relevant magazine! shared on Pinterest! I love the picture you painted of Jesus praying for me!! Me. A mess of a mom. A mess of a frazzled person. He prays for me. Thank you Jesus for loving Me! What beautiful encouragement today! I’ll share on FB, Twitter, and Pinterest. I love these 5 ideas, especially the idea of just inviting Jesus to come along with whatever you’re doing. Like a breath of fresh air for the soul. I would love to read this encouraging book. I shared on Twitter too. Thank you for the opportunity! This book looks stunning, like a balm to the weary, wounded soul. I would love to read it! Jennifer! Thank you so much for featuring my publishing post this week! And I think we all need the message of Bonnie’s book. Sounds so encouraging and needed in the busy world we live in. I love number 1. Jesus. That does so much for me! I would like to read this book. Bonnie’s thoughts about journaling as a way God can communicate with us resonated with me. By the way, I finished reading The Happiness Dare last month. I am a thinker and an experiencer. I would love to have this book! I too struggle with finding those pockets of rest for my soul when life is chaotic. Thank you for sharing, Jennifer! Godspeed to you, Bonnie! 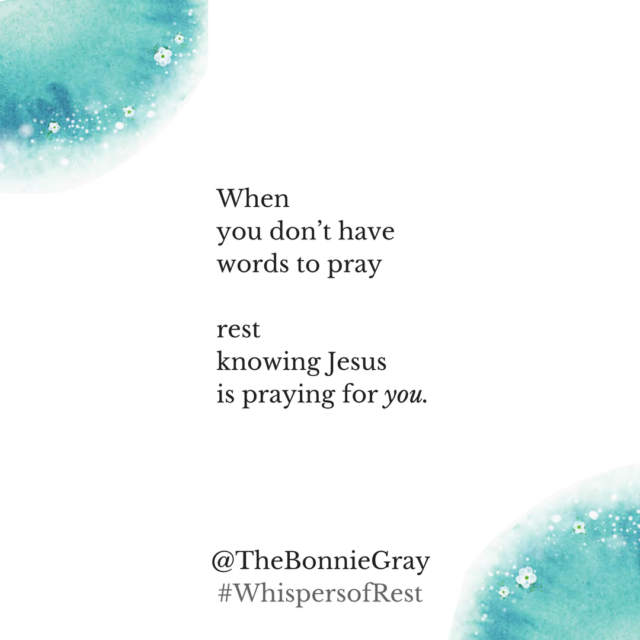 I would love a copy of Bonnie’s book, Whispers of Rest. Beautiful words. I am a believer in journaling and the healing that takes place when we write our prayers and our story, sharing our feelings with God. I love how Bonnie shares, “when we journal our stories with God, we give Him space to re-write our stories with us. Don’t you get ah-ha moments as you write?” These words are so reflective of God’s grace and love. Thank you for sharing! I have heard wonderful things about this book, and this post is a peaceful taste of the contents. Sharing this post with my readers on FB and Twitter today (8.9.17 at 3:30 p.m.). Thank you Bonnie for these practical suggestions! Your encouragements here are so much of what I am praying God cultivates in my heart and soul. I’ve gotten better, but I am most definitely a doer first and I have to be very intentional about choosing rest and quieting my heart. Too often, I learn the hard way that I pressed past a point I shouldn’t have. Thank you for your reminders, Bonnie. I’d love a copy of this book. Linda! You are the winner! Let’s connect via email or FB. My email is jdukeslee @ gmail dot com. Or find me on FB. Send me your mailing address! This was perfect for me to read today. I’ve been studying 1 Samuel with She reads truth, and was struck by Hannah’s deep faith– particularly in her prayers to God about giving her a child. She wasn’t afraid to pray hard, deep prayers to God– as the Message version says, she poured her heart out to God. I don’t know how to do that. I’m afraid to, honestly. I’m afraid to rest when there’s so much to do. I’m afraid to take care of myself when so many people need me! I’m afraid that if I try to let my guard down to God or to people, they’ll see me and all my mess and run. This was perfectly timed, Bonnie and Jennifer. Thanks so much. It was just what my soul needed. I would love to have this book for myself but I think my husband needs it more. He’s at a place where simply whispering the name of Jesus is about all he can do. I sure would appreciate prayers for him from anyone who reads my comment! I have found all five of these to be true in my life :). Especially the journaling part. As a blogger, I find myself constantly asking myself what lesson I can learn from the situations I find myself in. I’d love to have a copy of this book….just what I’ve been longing for…REST! Can’t wait to read! I would love a copy of this book! Sounds just what I have been needing. Thank you, everyone, for entering the drawing for this book. We had SO MANY entries, and I suspect it’s because we are all needing a little more REST in our busy lives. The winner is Linda Perkins. And I will be contacting her directly. If you didn’t want, I highly recommend picking up the book. It’s only $9.48 on Amazon right now!